What was allready presumed has been confirmed during Bram's participation at the Vikingtour in Norway: the M5 Carbon High Racer proves to be a superior bike for steep ascendings. 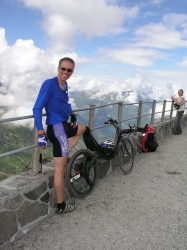 In 2003 Bram also did the Dalsnibba in just 25 minutes on his M5 Titanium Shock Proof. It's an ascend from 1004 metres to 1550 metres on gravel. Despite the additional three years since then, Bram managed to improve his time on the High Racer to 22 minutes and 50 seconds! The other small pictures give an impression of the beautiful landscapes which were visible during the trips. And Bram Moens is going to ride it! The Vikingtour is a hard challenge, but Bram Moens is determined and starts July 23 on a hard, but also beautiful tour through Norway. The Vikingtour typifies by long and steep decends. During the survey of the route, Bram only did 6 km/h of the steepest slopes, up to 18%! Bram uses both the superlight M5 Carbon Low Racer and Carbon High Racer, depending on the type of terrain he encounters from day to day. On the rare intervals when circumstances allow less strains, the beautiful landscapes of Norway can be enjoyed. A full report of the tour will be put on this site shortly. For general info please visit the site of the Vikingtour itself. Vincent Debleds (M5 Low Racer) and Christian Vergnaud (M5 Tica) did cover the 636 kilometres from Bordeaux to Parijs in 19 hours and 16 minutes, taking the first en second place among the participating recumbents. After half a year of preperation the new M5 Carbon High Racer has been presented on the annual event Cycle Vision. 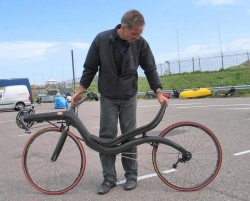 It's the lightest and stiffest production bike on earth! Stiffer than any comparable aluminum bike. Surely not when it's concerning a technical and complicated design like the latest from M5: the "full monocoque" Carbon High Racer. This high tech machine is the result of a unique combination of knowledge and experience which is not to be found at any other recumbent manufacturer anywhere in the world. 23 years of design and building experience has been culminated in this new product. Add the personal racing and record experience of M5 founder Bram Moens and a new norm is born. Minimal seat height (48 cm / 19 inch) in combination with maximal overview in everyday traffic. Stiffest frame combined with lowest weight, by using "Finit Element Method" (FEM). Again this is unique in the world of recumbents. Preservation of comfort because of the large wheel diameter and long wheel base (138 cm / 54 inch). Shortest possible stem lenghts as the result of well considered geometry. We don't use 40 to 50 cm (16 to 20 inch) long stems, but short stems of just 17 to 23 cm (7 to 9 inch) length, thus making folding stems redundant. Short stem lenght means also: less flex and less weight. New feature is the ultra light Alu 7075-T6 handle bar of just 45 grammes. This is possible because the handle bars don't have to endure the heavy load which is normal on the handle bars of conventional bikes. Customers have a choice of three different stem angles. The seat angle can be altered by means of four different carbon seat supports, varying from 17 to 28 degrees. The black anodised right dropout for the rear wheel is made from Alu 7075-T6 too. It's interchangable and available in two different lenghts, to utilize a cassette for flat terrain or for mountainous circumstances. Not visible on the pictures are the super safe male/female alu joints for bracket housing and chain guider. On the carbon telescopic bracket a carbon attachment for lighting is provided. Also on this racer: three M5 inserts for mounting a carbon rear fender! We decided deliberately for a bit more rugged frame, to obtain the lightest and stiffest result, combined with the smallest possible diameter. Additional advantage is that the telescopic tube always has the right position and unwanted rotation from the exact symmetry is no longer possible. On the right side of the ball bearing tube an aluminum M5 insert is fitted which enables the chain to be guided above the front wheel. This provides unobstructed steering, which is essential during meandering and steep ascends. Naturally it's possible to choose a direct returning chainline when riding in flat terrain, saving a bit of friction and a chain guider. The Carbon High Racer is available from january 2007. Based on Shimano 105 parts, the bike will cost around 2937 euro (ex VAT). If you're interested to obtain a Carbon High Racer too, it's possible to subcribe for one by sending us an e-mail. 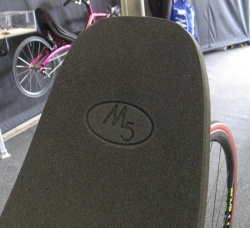 The light weigth ibiliet M5 cushion now has the M5 logo printed on it. Cushion has a EV50 top layer and a EV30 layer under it. 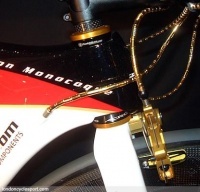 This Bling-Bling bike is equipped with the light weight brakes from M5, coated with gold! The bike is not only to show off, but will actually be used in races. At the bottom of the linked page also some nice carbon accessories for the toilet! 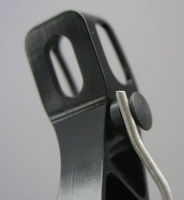 This new spring guide for our M5 sidepull brake is one of the smallest and lightest parts we produce at M5 Recumbents. Since this new version works so much better than the previous version, we surely want to share it with you! M5 considers it a challenge to optimaize all parts, even the smallest!